This is our brand new wood dolly, which is perfect for urban and city living. It is simple in design while complex in function so that you can use it anywhere. Constructed of premium MDF, it is durable for years of use. 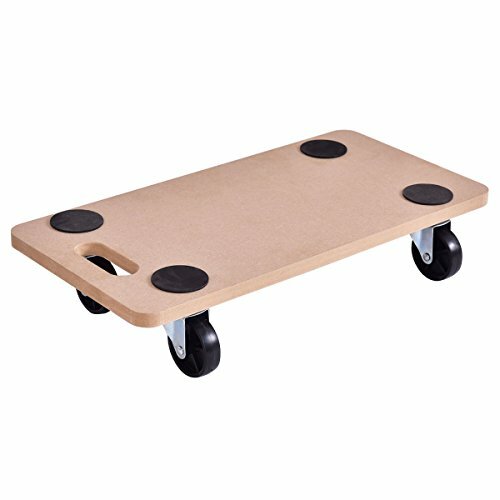 This wood dolly features 4 PP wheels, making mobility more easier and smoothly. Don't hesitate to bring one home now! Sturdy and Durable: This furniture dollies movers carrier is made of premium MDF, which features solid and sturdy. Besides, the max weight capacity is up to 440 pounds, it can bring you a reliable using experience. Flexible Mobility: Four heavy duty PP wheels not only make the dolly for flexible and stable mobility, but also offer stability while loading the furniture. It is quite a good helper when you need move service. It is totally labor-saving. Multipurpose: Although the wood dolly simple in design, it is complex in function. It is ideal for urban and city living. It is widely adopted in various situations. It is perfect for transporting large loads and heavy items with greater ease. Moreover, you can use it both indoors or outdoors. Easy to Carry and Store: With a total dimension of 23" x11.5" x 5"(L x W x H), its small body makes you more effortlessly to carry here and there. Also, you can put the item it anywhere you want without taking up much space and no installation requirement is required for the item. Security Assurance: The rounded design of the board makes furniture dolly not to damage the furniture in your home when you move it. There are four non-slip mats on the board to ensure the stability of the goods during transportation. In addition, the four PP wheels also protect your floor from the damage.